Around my house a cry of “Go clean your room!” is often met with heel-dragging and resistance. Even after I repeat the request, the job might get done in a half-hearted way. What’s a mom to do? Maria Montessori said, “Play is the work of the child.” She was right. When children go to school, their school work comes before play. Much like homework, adding chores to a child’s life helps teach them responsibility and how to balance play and work. Of course, most children prefer to play, and may not be eager to empty the dishwasher or fold laundry! Getting kids to do chores may seem like more trouble than it’s worth, but it pays off in the long run. Helps build your child’s confidence and independence. Promotes both family bonding and the importance of working together when done as a family. Increases the likelihood that children will participate in community or volunteer work as adults, and be more successful partners in their relationships. Perhaps start with a family discussion about why they’re being asked to pitch in. Kids are more likely to be willing helpers if they’re included in the decision to do chores and which ones to do. Make a list of all of the chores or jobs it takes to keep your home running. This will be eye-opening for your kids – they probably have no idea how hard you work! Break up the chores into daily, weekly, and monthly ones. Your children probably have enough on their plates every day as they juggle homework, after-school and weekend activities, and playtime. Consider assigning just a few daily expectations. For example, ask your kids to put their dirty clothes in the hamper, feed the pets, and clear the dinner dishes into the dishwasher every day. Make a list of chores that need to be done and allow each person in the family to choose 2 they will complete. Work together at the same time and don’t forget to play some loud music! In an hour or so your house will be clean, your children will have learned how to clean, and you might have had fun together. Choose appropriate chores for your child for their maturity level, abilities, and character. Most parents have been in the habit of doing everything for their children for so long that they underestimate how much kids are capable of accomplishing. Most 7-year-olds can set the table or fold the laundry. 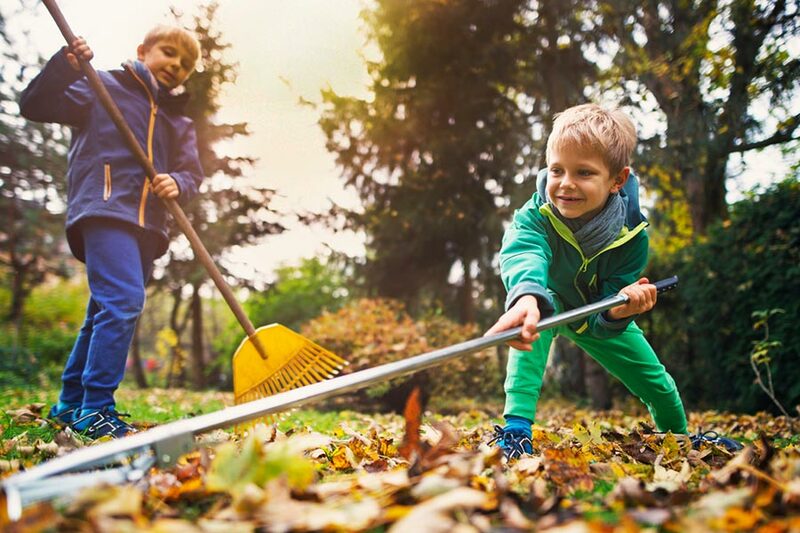 An active child who likes to be outdoors may do better raking leaves or washing the car. Allow for imperfection. Try to ignore your desire to have things done as you would do them. At least in the beginning, accept that getting the work done is for the benefit of your child, even if they don’t do it perfectly. Involve your child in the choice of chores. Give them a list of tasks that need to be done. Explain that some of the chores are mandatory (like making their bed and picking up their clothes), while they can choose the others. Set clear expectations. Agree on how often and when chores need to be completed. Create a chore chart to track when chores get done. Take time to show and teach your child what a chore involves. If they resist, do the chore with them at first. Supervise once or twice before having them do it on their own, and continue to provide positive feedback and reinforcement. Create the right balance. Too many chores can make your child feel overloaded and frustrated. Make sure they have time each day to play and relax. When you can, assign fun chores or look for ways to make the regular ones more enjoyable. Don’t link allowance to chores. Expect chores to be done on a routine that’s separate from allowance. Teach kids to become self-reliant adults who contribute to the world around them – not just because someone is paying them – because it’s the right thing to do. An allowance recognizes your kids’ needs and wants above and beyond the basic necessities you give them. Even more important, an allowance is given to children to help them learn to manage money before they are young adults. You might offer to pay them for less frequent, monthly, or bigger chores. Perhaps you need the windows washed or the garden weeded? You’ll probably have a willing helper if you offer them a small monetary reward for their efforts. Now, around my house, are the kids’ rooms clean? Well, no, usually not. But when I ask for help with dishes, laundry, or dog-walking, I’m not met with resistance. Their room is their space that I’m (within reason) letting them control. However, they all have a clear understanding our home is a mutually enjoyed space and I’m not a magical worker bee who cleans it for them! They willingly share that responsibility. For more information about allowances, read our post: Dollars and Sense: Starting an Allowance.